Featured above: The Pillars of Creation, as captured by the Hubble Space Telescope in 1995. In this episode, I mentioned Antoine Lavoisier only briefly, in the opening of this episode, but we’ll hopefully be hearing much more about him in future episodes. He lived a fascinating life and made innumerable contributions to the then-nascent field of chemistry. Lavoisier was not the discoverer of hydrogen, per se — that credit is often given to Henry Cavendish. However, Lavoisier was the first to recognize it as a discrete element and name it as such. Cavendish called it “dephlogistated air,” as part of a theory of combustion that was very popular at the time. Incorrect, but popular. Atomic Structure: I deliberately tried to avoid invoking the Bohr model of the atom, which shows electrons as orbiting their atomic nucleus in a manner similar to planets orbiting their star. This is an obsolete model, and doesn’t illustrate the pure weirdness that happens on the atomic scale. The realm of very small things simply does not work anything like the world we live in. The story of how this image was captured is fascinating in its own right, and can be read at Geek.com. 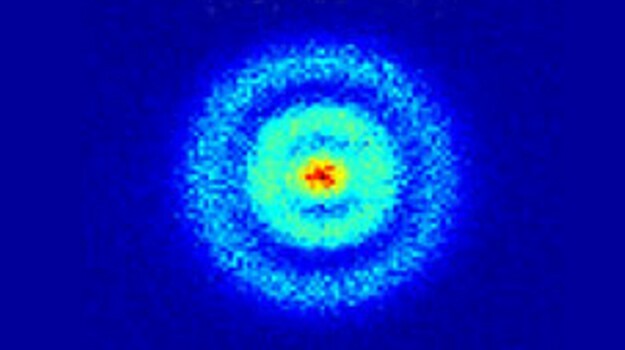 The image here pushes the limits of what could be called a “photograph,” but it accurately shows the structure of a single hydrogen atom. The red center is the nucleus, with its one proton, and the light blue portion of the image is the electron cloud. Although the electron is extremely small — much smaller than the proton — it moves unbelievably fast. This motion is not anything that would look familiar to us, which is why the Bohr model, with electrons “orbiting” the nucleus, can be rather unhelpful. We can’t tell exactly where the electron will be at any given moment in time, but we do know it will be somewhere in that cyan cloud. Verifiable reports of balloon flight begin in 1782 with Joseph-Michel and Jacques-Etienne Montgolfier, French brothers who were some of the earliest pioneers in modern flight. Thaddeus Lowe, the Civil War aeronaut, has a story that’s worth a little more attention than I could afford in this episode. He had a particularly outlandish rivalry with John La Mountain — two men with exactly the kinds of egos you’d expect from 19th century balloonists petitioning the government. I should note that my claim of the USS Fanny being “America’s first aircraft carrier” is rather tongue-in-cheek. Probably every serious historian would agree that the United States’ first aircraft carrier was the USS Langley, which took her maiden voyage in 1934. There does, however, seem to be some hemming and hawing over whether the USS Fanny counts as the “real” “first” aircraft carrier, or if that honor should go to the USS George Washington Parke Custis, a barge that was specially outfitted for the task, rather than the jury rigging that took place aboard the Fanny. Since the Fanny‘s expedition is reliably sourced to an earlier date, that’s what I went with. There’s a lot more to that story, too. By the way: That second ship, the George Washington Parke Custis, is named after one man, and his life story is compelling in its own right. He was the adopted son and step-grandson of U.S. President George Washington, and that’s only the beginning. At any rate, the Union Army Balloon Corps was useful, and scrappy, and was only disbanded for petty bureaucratic reasons after a change in command high up the chain. In a just world, America would be home to a long-respected Balloon Corps that found even more use in peacetime than war. Wowee, A Zeppelin! : There’s a legend that the Empire State Building was built with a mooring mast for zeppelins, but this is, at best, half true. 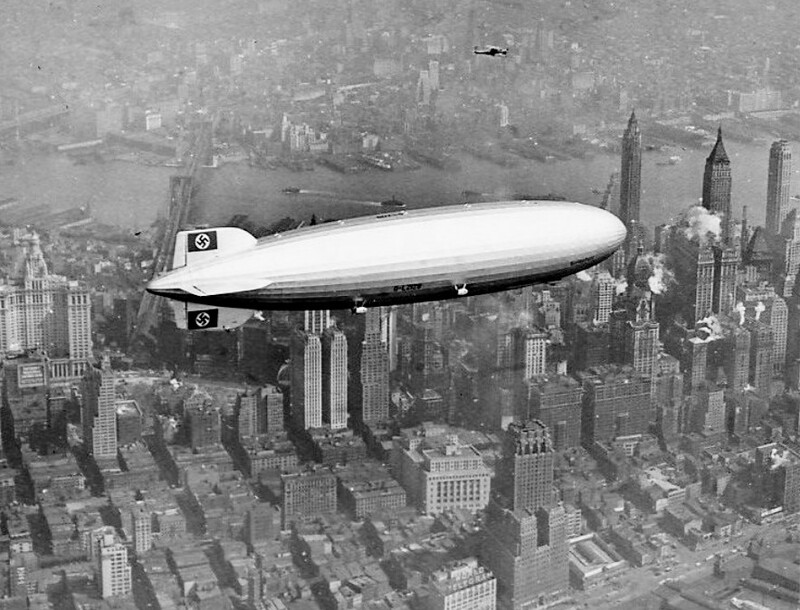 There was practically no demand for a dirigible terminal in Manhattan, and it’s unlikely that a mooring mast in such a location could even operate safely. There were a few attempts, but not much success. The real motivation behind the stated goal was that the ESB’s investors simply wanted to ensure that it would be the tallest building in the city — and the world. For some reason, it would be too improper to just say that. There’s a fascinating New York Times story with some excellent photos, including a fake photograph of the US Navy airship Los Angeles docked atop the Empire State Building. The Hindenburg flies over Manhattan on May 6, 1937. I’m afraid that Herbert Morrison will be forever remembered by history as a somewhat hysterical man. He did legitimately display some extreme emotions as the Hindenburg exploded in front of him, but the high pitch and speed of his voice really add to the sense of panic. The thing is, Morrison was actually renowned for his deep and pleasant voice, like many broadcasters in the early 20th century. Unfortunately, on the day of the Hindenburg disaster, his recording equipment was running a little slow, so when played back at “normal” speed, it was actually sped up considerably, and the pitch shifted higher. I debated including the corrected audio in the podcast, but ultimately decided to use the version that people actually heard back in 1937. 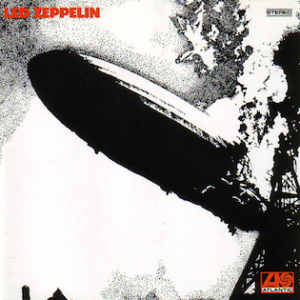 Led Zeppelin’s self-titled debut album, released in 1969. One of the Hindenburg disaster’s lasting cultural echoes is in the name and artwork of the band Led Zeppelin. Keith Moon and/or John Entwistle, both of The Who, famously cracked that a new band with Jimmy Page, John Paul Jones, and Jeff Beck would “go over like a lead balloon.” Page ran with the thought, dropped the “A” from “Lead” to prevent mispronunciations, and used Sam Shere’s photograph as artwork for their debut album. One person was decidedly not a fan of Led Zep: Eva von Zeppelin, the granddaughter of Ferdinand. She didn’t like the idea that these young rascals were making money off her family name, particularly in such a poor light. It didn’t help that she hated the music, too. She dogged the band at the beginning of their career, threatening lawsuits and causing the band to change their name to “The Nobs” on at least one occasion. Lenses for the Big Lens: Sometimes, an instrument called COSTAR is called “Hubble’s Contact Lens,” but that’s only half the picture. The heavy lifting was actually done by the Wide Field and Planetary Camera 2. For more details, see Fixing Hubble’s Blurry Vision from Space Flight Now. Here are the notable images taken by Hubble that I mentioned in this episode. Hundreds more are available at HubbleSite.org. Hubble’s “First Light” image, which was not as sharp as it was supposed to be. 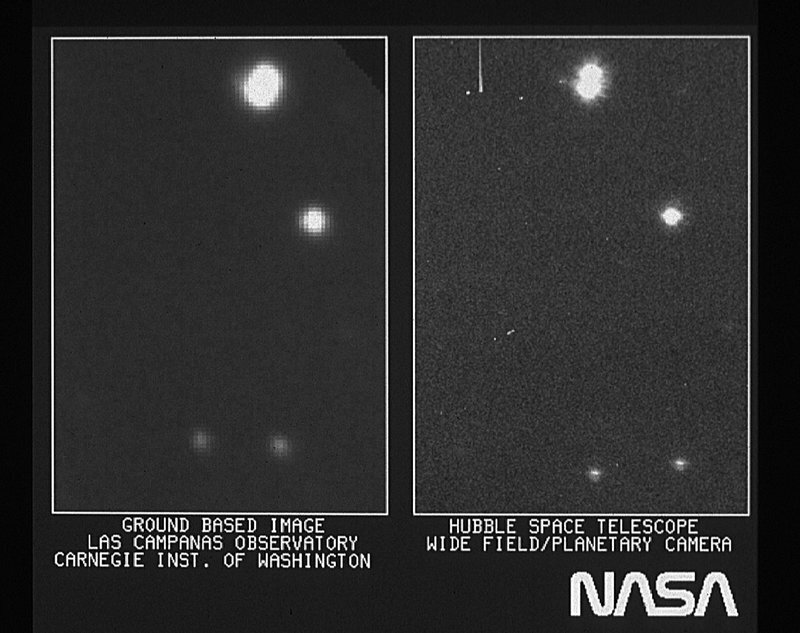 Left, before Hubble’s vision was improved; right, after. After recording, I learned that NASA is currently building yet another meticulously precise instrument in the Large Synoptic Survey Telescope. Here’s hoping they’ve learned a few tricks in the past several decades. My Own Private Hydrogen: As promised in the show, here’s a link to Theodore Gray’s Homemade Hydrogen electrolysis experiment. He gets into a lot of detail, but in such an accessible way that you should go straight to his website rather than listen to me try to explain it. Four irreducible kinds of matter make up everything that exists. There is earth and all things solid; water, and the liquids; air and other gases; and fire, with its light and heat. This had been established as fact thousands of years ago, espoused by philosophers from Greece to Japan and everywhere in between. This was taught to children and employed in medicine. In short, trying to upend this philosophy would be bold, to say the least. But that sounds kind of clumsy, even in French, so Lavoisier translated the name into Greek, giving element 1 the name you know it by today: hydrogen. This week, we’re taking a look at Element 1, Hydrogen. An atom is the smallest piece of an element that exists. The only amount of hydrogen less than one atom is no hydrogen at all. But that atom is still made up of other, smaller things. It’s sort of like how an axe is made of a handle and a blade. You could separate those two things, and then you’d have a handle, and you’d have a blade, but neither one of those is an axe on its own. It would be pretty hard to chop wood using either piece alone! Like our metaphorical axe, one atom of hydrogen consists of two smaller bits: One proton, which sits at the atom’s center, surrounded by one electron. The proton has a positive electric charge, and the electron has a negative electric charge. They’re attracted to each other by these opposing charges, like the opposing poles of a magnet. The center of the atom, where the proton lives, is called the nucleus. And that proton is pretty important: It’s what makes our atom hydrogen. If there were two protons, it would be helium; if it had six protons, it would be carbon. The number of protons in the nucleus is sometimes called the “atomic number,” which can be a handy way of referring to an atom other than its name. So hydrogen, with one proton in its nucleus, has an atomic number of 1, and can be called Element 1. By the way, I did say that one electron “surrounds” the nucleus, and that’s probably the best way to think of it. Even though an electron is much smaller than a proton, it’s moving so unimaginably fast that it forms a shell around the nucleus. This is kind of like when the individual blades of a fan spin so quickly that they appear to be a single hazy circle. So there’s our first element of the periodic table: Hydrogen, with one positive proton in its nucleus, one negative electron surrounding it, bound together by opposing charges in a neat little package. It should be easy to find where it belongs on the periodic table, right? Unfortunately, it is not.3 Remember how elements in each group are supposed to be similar to each other? Well, sometimes, hydrogen behaves like the elements in the first group: Lithium, sodium, etc. All those elements can be explosively reactive under common conditions — as we’ll see in a few minutes. But that also doesn’t quite fit: All those other elements in Group 1 are solid metals. Group 17 contains a couple gases, fluorine and chlorine, and like hydrogen, they’re highly reactive. Placing hydrogen above them would make sense, and would also put it right next to helium — the only other element in period 1. But it’s not a perfect fit. Sometimes hydrogen actually resembles carbon — and those two elements alone can combine in nearly infinite ways. You’re familiar with some of them: oils, plastics, rubber, and many, many more. To be clear, this is not exactly a huge controversy of chemistry. Scientists are well familiar with the peculiarities of nature’s simplest atom, and they either shuffle it around as needed, or just keep it separate from the other elements in their heads. And that kind of makes thematic sense, too. When present as a pure gas, hydrogen really does float above all the other elements. By virtue of being the simplest atom, it’s also the lightest. Once hydrogen became easy to acquire in the 19th century, that’s exactly what made it so desirable. Flight has eluded humanity for most of our history. We could walk the earth and sail the seas, but the skies were the exclusive domain of the wind and winged beasts. For a long time, many saw this as the right and natural order of things, not something to be overcome. In Greek mythology, Icarus defied the gods and flew on wings of wax. Being a mere mortal, unaccustomed to the sheer joy of flight, he became reckless and flew too close to the sun. His wings melted and he tumbled into the sea. Balloons improved incrementally for about a hundred years, but were mostly a curiosity for the rich. They started to see applied use during the American Civil War. Zeppelins are airships with a rigid body, unlike a hot air balloon, which must be inflated. This allows them to achieve a much larger size and withstand strong winds. Zeppelins were primarily employed as air weapons during World War I, but they enjoyed a peacetime renaissance as passenger vehicles in the 1920s and 30s. Airships circled the globe, ferrying the rich and famous among cosmopolitan locales like Frankfurt, Rio de Janeiro, and New York. One even made a seven-day voyage to the Arctic. By the mid-1930s, the zeppelin had become a grand symbol of German pride. The Hindenburg was a truly impressive ship — to this day, it remains the largest flying object in human history, on a scale that’s difficult to grasp. It was about as big as two American football fields stacked end-to-end. A Goodyear Blimp, the kind that typically soars above those fields, could comfortably float inside the Hindenburg’s balloon with plenty of room to spare. So could a second one. And probably a third. The reason the ship was so big — aside from the grandeur of it all — was because German engineers wanted to ensure the safety of their passengers and crew. Nothing provides lift as efficiently as hydrogen, but it has a major drawback: It is highly explosive. The Zeppelin company was going to avoid this problem by using helium — a gas with the benefit of being entirely non-reactive, at the expense of being slightly heavier. Thus, it requires a little more helium than hydrogen to lift the same mass in the air. Everyone agreed that this was a worthwhile trade-off and a good plan. Unfortunately, it was not a plan they could execute. In the 1930s, helium was extremely difficult to acquire. The United States had a virtual monopoly on the world’s supply, and they weren’t about to loosen that grip just because the Germans wanted to inflate a big balloon. This was discouraging, but not a fatal blow for the Hindenburg. The Germans would simply have to fall back on that old standby, hydrogen. It was more dangerous, yes, but Germany had decades of experience flying hydrogen airships without a single fatality, or even injury. 1936 was a good year for the Hindenburg. It made 56 flights, criss-crossing the Atlantic Ocean several times. One of its ports of call was Lakehurst, New Jersey, just 50 miles from New York. And while the ship had avoided being named after Adolf Hitler, it was still a ship built in and partly funded by Nazi Germany. A particularly unsettling photograph taken on May 6, 1937 shows the zeppelin flying in a perfectly clear sky, swastikas emblazoned on its tail fins, just above the distinctive Manhattan skyline. You can see this yourself at episodic table dot com slash hydrogen. But that was not the most famous photograph taken of the Hindenburg that day. It’s not clear exactly what happened, but at some point when the Hindenburg tried to land at Lakehurst, something went terribly wrong. A gas leak, and perhaps a spark of static electricity, were all it took to set the entire enormous craft up in flames. Fully loaded with 97 passengers and crew, the airship crashed to the ground in a great conflagration, a spectacle that was captured by newsmen on the scene, most famously by Herbert Morrison, a journalist for Chicago news radio. It’s starting to rain again; it’s… the rain had, uh, slacked up a little bit. The back motors of the ship are just holding it, uh, just enough to keep it from… It’s burst into flames! Get this, Charlie; get this, Charlie! It’s fire… and it’s crashing! It’s crashing terrible! Oh, my! Get out of the way, please! It’s burning and bursting into flames and the… and it’s falling on the mooring mast. And all the folks agree that this is terrible; this is the worst of the worst catastrophes in the world. Oh it’s… [unintelligible] its flames… Crashing, oh! Four- or five-hundred feet into the sky and it… it’s a terrific crash, ladies and gentlemen. It’s smoke, and it’s in flames now; and the frame is crashing to the ground, not quite to the mooring mast. Oh, the humanity! This was a watershed moment in media history. Although the coverage was not broadcast live, it was heard worldwide, often alongside photographs and newsreel footage of the catastrophe. For the first time, a tragic accident was more than a momentary disaster — it became a cultural experience shared with people who had been far from the scene of the actual incident. Incredibly, 62 people survived the crash — but the zeppelin industry did not. These graphic images and sounds were too horrifying for the public to bear, and the golden age of airships was over. Hydrogen, however, would soon be flying even higher. It’s very difficult to go to outer space. A tremendous amount of energy must be spent to escape Earth’s gravitational pull. Every kilogram of material costs tens of thousands of dollars worth of rocket fuel to bring along for the ride. Additionally, carrying the extra fuel to lift that payload causes the rocket to weigh more… which means the rocket requires more fuel. And that makes the rocket weigh even more, requiring even more fuel. That might sound a little strange. Why bother sending an expensive, fragile telescope to space instead of just building a big one here on Earth? Coincidentally, the vacuum of space suffers none of these problems. So under Spitzer’s guidance, NASA proposed the Hubble Space Telescope, named after legendary astronomer Edwin Hubble. The project spent most of the 60s and 70s in various committees until funding was finally secured from Congress in 1977. Design and construction began in earnest, and the team worked diligently toward an anticipated launch in 1983. After such a long wait, NASA was champing at the bit to show off what their new toy could do. A public relations officer invited the press to witness the transmission of Hubble’s very first photograph. This was not standard operating procedure: The image was likely to be the most unremarkable photograph it ever took, just a test of all the optics systems. Nonetheless, there was much fanfare surrounding the delivery of that first look out of Hubble’s eye. NASA was able to play this off in front of the cameras, but away from the media, they were reeling in panic. Scientists on the ground tried every trick they had to improve the picture remotely, even trying to bend the mirror ever-so-slightly — but nothing worked. This was a crushing blow. NASA took a beating in the press, everywhere from news magazines to late night comedy shows. It was the last thing that the struggling and underfunded space program needed. Astronomers used the broken telescope as best they could, but it was like driving a car with a spare tire: It just couldn’t do everything it was supposed to do. But this research was enough to keep the telescope from being abandoned outright. And that bought NASA just enough time to come up with a fix. The reason was because NASA had endured a number of public failures, even aside from the blurry telescope and the Challenger explosion. Minor failures with satellites and antennas were cumulatively embarrassing, and recently, a $1 billion Mars orbiter had simply vanished without a trace. Many people were worried that one more failure would do the agency in for good. The astronauts completed their mission without incident, but no one knew yet whether they had actually fixed the problem. Astronomers huddled around a screen with bated breath to see the first new image from the Hubble. There were no reporters at this event. It was a huge relief to everyone in the room. Half a century after Lyman Spitzer proposed his space telescope, humanity could see the universe with newfound clarity. Finally, NASA had a public victory. The Hubble would go on to take hundreds of photographs that would amaze the viewing public. It would capture entire galaxies colliding in slow motion, photograph nebulae that looked like enormous watchful eyes, and peer so deep in space that it revealed a time when the universe was brand new. But perhaps the most celebrated photograph the Hubble ever took is one that makes an appropriate place for us to end our journey. The telescope had turned its eye to a region of the Eagle Nebula, revealing enormous columns of hydrogen gas, towering light-years high. In the hearts of those stars, heavier elements are forged. But that’s a discussion we’ll save for next time, with helium. Some people enjoy collecting stamps in a pursuit known as “philately.” Others prefer to amass a collection of coins, a hobby known as “numismatics.” But perhaps neither of these piques your interest. You’d like to get involved with something a little more exciting, a little more dangerous. Something that requires studying a little bit of chemistry. Well, element collecting is just the hobby for you! Unfortunately it doesn’t have a fancy esoteric name, but give it time: it’s still a pretty new hobby. It’s also one that’s fraught with difficulty. Some of these elements are highly toxic. Others are difficult to tame, with a radioactive bite that extends beyond any cage that can contain them. Luckily for you, I’m here to help. Each week, after we look at the science and history behind one particular element, I’ll let you know what your best bet is for acquiring a pure sample for your collection. And much like hydrogen makes a great entry point for learning about the periodic table, it’s an easy place for the newfound element collector to start their stockpile. Most elements need to be sourced secondhand: Neon from electric signs, for instance, or americium from old smoke detectors. But hydrogen is the only element that you can actually create wholesale in the comfort of your own home. You might not think of it this way, but you have a ready supply of hydrogen piped right into your kitchen — it’s just all bound up with oxygen in the inconvenient form of water. All you need to do is crack that H2O into hydrogen and oxygen. but it’s a surprisingly simple process called electrolysis. At the bare minimum, all you need is a 9-volt battery, a bowl of water, and two paper clips. Bend one paper clip around each terminal, positive and negative, and dip the ends of the paperclips in the water. This will cause an electric current to flow directly through the water, and bubbles will form around the submerged paperclips. The paper clip attached to the positive terminal will gather oxygen, and the paperclip attached to the negative terminal will create hydrogen atoms. The hydrogen paperclip will attract twice as many bubbles as the oxygen paperclip — this is because water is composed of twice as much hydrogen as oxygen. H2O. Fill a bottle with water to prevent mixing with ambient air, then slip it over the negative paperclip, and you can collect the hydrogen for safe keeping. Congratulations! You are now an element collector, and have created a sample of nature’s simplest atom. Hydrogen accounts for three out of every four atoms in the universe, mostly in interstellar clouds, like the Pillars of Creation. But these hydrogen atoms are yours. Theodore Gray is a researcher and author who’s responsible for much of the recent popular interest in chemistry. His book, “The Elements,” is a gorgeous exploration of the periodic table. I’ll be pulling a lot of information from it, and if you enjoy this podcast, it’s absolutely worth picking up. His website also provides a wealth of information about the elements, including some tips on how to make this electrolysis setup more efficient — and some important safety notes to go along with them. I’ll provide a link to this, as well as a lot more fascinating information that didn’t fit in this episode, at episodic table dot com slash hydrogen. Music is by Kai Engel. To see images and watch videos, read episode transcripts, and comment on episodes, visit episodic table dot com. Next time, we’ll keep things light with Helium. This is T. R. Appleton, reminding you not to fill your passenger airships with highly explosive gas. NASA, The Tyranny Of The Rocket Equation. Flight Engineer Don Pettit, May 1, 2012. Elements and Atoms, Chapter 6: Water is not an element. From lemoyne.edu. City Collegiate, Position Of Hydrogen In Periodic Table. Info on hydrogen’s chemistry and place on the periodic table: Encyclopedia.com, Hydrogen. Science of Everyday Things. Copyright 2002, The Gale Group Inc.
Overview on balloon technology and history: what-when-how.com, Balloons. Naval History Blog, The Birth Of The Aircraft Carrier. From the Naval Institute Archives, August 1, 2012. America’s First Aircraft Carrier Sorties, Bill Lee. Originally from nnappentice.com, backed up on this site for archival purposes. Zeppelin in Minnesota, A Study In Fact and Fable, Rhoda R. Gilman. Originally from The Minnesota Historical Society, backed up on this site for archival purposes. University of Houston, Engines Of Our Ingenuity. No. 1682: Zeppelin In Minnesota, John H. Lienhard. “Goebbels wanted to name the ship for Adolf Hitler.” Christopher Klein, History.com. The Hindenburg Disaster: 9 Surprising Facts. May 4, 2012. An absolute wealth of information about the Hindenburg was found on airships.net, the kind of robust website all aficionados of niche interests should aspire to create. Space.com, Hubble Telescope At 25: The Trials And Tribulations Of A Space Icon. Nola Taylor Redd, April 20, 2015. Space.com, Why Are Space Telescopes Better Than Earth-Based Telescopes? Remy Malina, April 24, 2010. Texas A&M University, Hubble Error: Time, Money and Millionths of an Inch. Robert S. Capers and Eric Lipton. Originally from people.tamu.edu, backed up on this site for archival purposes. Wired, May 20, 1990: Hubble Opens Its Eye … And Blinks. Betsy Mason, May 19, 2010. Time Magazine, The Story Of Hubble’s First Photo — 25 Years Later. Jeffrey Kluger, May 19, 2015. Science Clarified, Chapter 5: Hubble. Info on Hubble’s altitude and speed: Popular Science, The Man Who Fixed Hubble. Shannon Stirone, October 10, 2016. The New York Times, Mission To Correct Hubble’s Flawed Vision Faces Many Pitfalls. John Noble Wilford, November 30, 1993. Overview of the Hubble repair mission: NASA, STS-61 (59). Spaceflight Now, Fixing Hubble’s Blurry Vision. William Harwood, April 23, 2015. 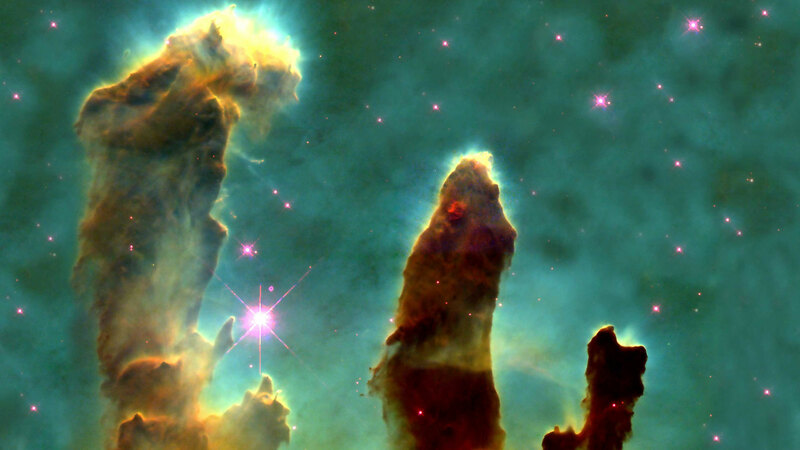 Hubblesite, Gas Pillars in the Eagle Nebula (M16): Pillars of Creation in a Star-Forming Region. November 2, 1995. SpaceTelescope.org, New View Of The Pillars Of Creation — Visible. January 5, 2015.